Butterflies are FREE at YarnWars! Crochet 3D Butterfly Kisses! Today I am presenting the newest in our YarnWars patterns! To be honest, this started off a flower. I was trying to do something creative, but as I was stitching along, I noticed something interesting when this “flower” started getting crazy on me and folding…. it turned into a lovely little butterfly! A 3 dimensional butterfly at that! So, of course I was on my way to writing down this 3D Butterfly Kisses pattern to share with all of my friends here! It is easy to make, it is perfect for just about any project, and best of all… it’s FREE!!!! 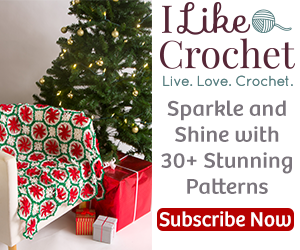 I hope you enjoy, the terms of the pattern are the same as all of my other patterns, you will find them on the written pattern page which can be found by CLICKING HERE! I have also completed a FULL Video tutorial on our Channel which can be found by CLICKING HERE!